In its latest play at the Chinese market, Apple on Monday released an updated version of GarageBand with a heavy focus on Chinese music, introducing new regional instruments, Chinese music loops and Chinese language localization, among other feature additions like social network sharing. The latest GarageBand version "celebrates the rich history of Chinese music" and comes with traditional Chinese instruments like the pipa, erhu and Chinese percussion, each of which can be played back on iPhone or iPad via multitouch gestures, as well as the Musical Typing feature and USB-connected music keyboards on Mac. In addition, Apple includes 300 Chinese musical loops for quick track creation. 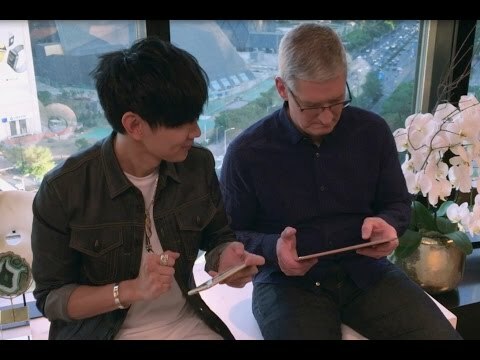 "GarageBand is the most popular music creation app in the world and we're excited to introduce these new features that incorporate the rich history of traditional Chinese music," said Susan Prescott, Apple VP of Product Marketing. "By adding classic Chinese instruments and new Live Loop templates, the new GarageBand app makes it fun and easy to make Chinese-inspired music right on your iPhone, iPad or Mac." Specific to iOS, GarageBand gains two new Chinese music-inspired templates for Live Loops, one traditional and another modern, along with integration with Chinese social networks QQ and Youku. Both versions get 300 Apple-created loops inspired by various Chinese music styles, including guzheng, dizi, yangqin and Peking Opera. New users can download GarageBand for iOS version 2.1.1 and version 10.1.2 for OS X for $4.99 from the App Store. Wow Apple sucking up to China hard. It seems odd that in the version release notes I see, there isn't a mention of the substantial new Chinese content. I would never have known if not for the press release and this article. How often does Apple do press releases for minor software updates? I think it's fair to say that Apple may be doing a charm offensive on the Chinese government just at the moment, but it is also fair to say that Chinese culture, music, theatre (etc) is indeed rich and they would be wise to exploit it even if China wasn't their fastest-growing market. It's called responding to your market. Seriously? Sucking up! The quality of your comments have really gone downhill lately. How about actually discussing the software instead of the politics? I have downloaded the new GarageBand 2.1.1 on iOS 9.3.2 on my iPhone 5S. I cannot find the Erhu or Pipa instrument or the new Chinese loops anywhere in the app. I can find the Chinese percussion (drums and gongs), however. There are no other new instruments or loops in the app at all compared to the previous version, as far as I can tell. I'm an English-language user and my iPhone 5S is set up with English as the default language. I wonder if these new instruments and loops are only available if you set up your iPhone for Chinese (which I can't handle). Over to GarageBand for Mac OS X: Yes, there are a new Erhu and Pipa and Chinese drum sample libraries. But this is not a big deal. These same instruments (represented by different, older sample libraries) have been available in the GarageBand Legacy World Instrument Jam Pack for more than a decade. (Back in 2006 the Jam Packs had to be purchased separately as add-ons to GarageBand, and they were very expensive. But for several years now all the Legacy Jam Packs have been included for free with every installation of GarageBand, meaning that all GarageBand users have already had a pipa, erhu and Chinese drums for years whether they knew it or not.) The World Instruments Jam Pack, as the name says, has many different instruments from ethnic music traditions all over the world, not just China. The Chinese loop collection just released is a totally new idea for GarageBand. I'm trying to check out the Peking Opera loops, but they must be downloaded separately and I can't get them to download. Apple's servers must be slammed at the moment. I presume these new virtual instrument sample libraries and loops are going to be pushed out in an update to Apple MainStage as well. How often does Apple do press releases for features not even mentioned in the release notes for said minor update? So Apple sees China as a giant profitable market - perhaps bigger than the USA. Good for them. Good for stockholders? I've given up trying to understand how Apple's stock arrives at a price. But serving the Chinese market I think will certainly be good for the health of the company. Thanks to your encouragement I found that setting and turned it on. These instruments are fun to play, particularly the erhu.